Once a patient receives a diagnosis at the Hyundai Cancer Institute at CHOC Children’s, family members meet with the oncologist who will outline the child’s treatment plan. Treatment plans, which are also called protocols, are based on a variety of factors including the type and extent of disease at diagnosis. Different types of cancers call for one or more different treatment approaches. Although hospitalization may be part of a child’s treatment plan, we strive to treat patients as much as possible on an outpatient basis so that they can focus on getting better in the comfort of their own homes and maintain as normal a lifestyle that their treatment will allow. The Cancer Institute is dedicated to making all of our outpatient services both convenient and comfortable for patients and families. The Cancer Institute has its own dedicated outpatient clinic for all appointments that do not include a hospital stay, chemotherapy or a special procedure like a lumbar puncture or bone marrow biopsy. Our clinic setting and special scheduling allow us to provide patients with access to many of the specialists and services they need all in one office visit. The Outpatient Clinic is located at 1201 W. La Veta Ave., Orange, CA 92868. Patients should park in the main hospital parking structure and proceed to the second floor of the clinic building. The Cancer Clinic is just past the elevators on the right. Families are encouraged to bring their oncology binder and a list of questions they may have for the child’s care team. Patients who are running late for their appointment should call (714) 509-8636 to let one of our staff members know or to reschedule. Some cancer treatment plans may call for surgical procedures in order to find out more about the cancer or to treat the disease. Outpatient procedures are performed in the CHOC Children’s Tidwell Procedure Center. Our state-of-the-art surgery center offers child life specialists, private rooms, the latest technologies and equipment, and much more. Learn more about the Tidwell Procedure Center. Find out how to prepare children of all ages for surgery. Get directions to the Tidwell Procedure Center. Research has shown that treating children on an outpatient basis, whenever possible, can promote faster recovery times and enhanced well-being. Thanks to the Cancer Institute’s Outpatient Infusion Center (OPI), patients have a dedicated outpatient facility in which they can receive infusions and procedures, like chemotherapy and other medications, without having to be admitted to the hospital for an overnight stay. (Chemotherapy can be used to control the spread of cancer, relieve cancer symptoms, or ultimately cure a patient’s cancer.) The OPI features 18 outpatient infusion stations, including two isolation rooms and two procedure rooms. The center includes a recreation therapy area and dedicated child life specialist, as well as televisions, DVD players and PlayStations at each infusion station. We truly believe in the healing power of play. Patients who are visiting the OPI should dress comfortably and families are encouraged to bring comfort items the child may want to have close to them during the infusion process. The OPI is located on the second floor of the CHOC Clinic Building on the right, just past the Outpatient Cancer Clinic. The OPI is open 7 a.m. to 7:30 p.m. Appointment times vary depending upon the patient’s needs. Patients who are running late for their appointment should notify the OPI staff as soon as possible by calling (714) 509-3030. Parents are encouraged to find alternate child care for the patient’s siblings so that they can concentrate on the patient’s needs during the infusion. Families arriving for infusion treatment should park in the main hospital parking structure and park in the special “Outpatient Infusion Center Only” reserved spaces on the second floor. CHOC Children’s Infusionarium is the first program of its kind to combine immersive video technology with life-saving infusion therapy, such as chemotherapy or IV antibiotics. 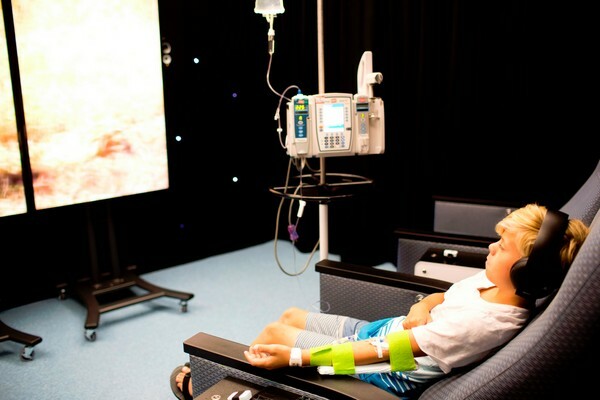 Located inside The Dhont Family Foundation Outpatient Infusion Center (OPI) at CHOC Children’s, the jumbo screens and fabric-draped interior look more like a deluxe home theater than a hospital treatment room. Radiation therapy is the treatment of cancer using beams of high-energy waves or streams of particles (radiation). When used in high doses, radiation can kill cells or keep them from growing and dividing. Normal cells are also affected by radiation, but unlike cancer cells, most of them recover from the effects. Radiation is often used before surgery to shrink a tumor, making it easier to remove the cancerous tissue. We partner with the St. Joseph Center for Cancer Prevention and Treatment’s specially trained pediatric radiation specialists to provide our patients with the latest radiation techniques. The St. Joseph Center for Cancer Prevention and Treatment is conveniently located across the street from CHOC Children’s. Patients receiving radiation therapy will receive specific instructions on preparing for the therapy from the child’s oncologist. On the day of the appointment, families should proceed to 1000 W. La Veta Ave., Orange, CA 92868 and park in the building labeled “St. Joseph Cancer Center Parking.” Patients who are running late should notify the St. Joseph Center for Cancer Prevention and Treatment staff by calling (714) 734-3145.